Egyptian and European excavators unearthed a collection of black granite statues depicting the ancient Egyptian lioness Goddess Sekhmet during their routine excavation at King Amenhotep III funerary temple in the Kom Al-Hittan area on the west bank of Luxor. The statues depict the goddess Sekhmet in her usual form, sitting on the throne with a human body and lioness's head. "This is not the first time statues of the lioness goddess have been unearthed at Kom Al-Hittan," said Mohamed Ibrahim, minister of state for antiquities adding that the Egyptian-European mission led by German Egyptologist Horig Sourouzian has previously unearthed 64 statues of Sekhment of different shapes and sizes. Ibrahim explained that such a large number highlights the important role of the goddess during the reign of the 18th dynasty king Amenhotep III, father of the monotheistic king Akhnaten and grandfather of the golden king Tutankhamun. Sekhmet was believed to be a protective goddess as she was also the goddess of war and destruction. "Some Egyptologists," pointed out Ibrahim, "believe that king Amenhotep constructed a large number of goddess Sekhmets in an attempt to cure him of a specific disease that he suffered during his reign." Sekhmet was well known of her supposed ability to cure critical deseases. Mansour Boreik, supervisor of Luxor antiquities, told Ahram online that the statues are very well preserved and each one is two metres tall. He continued saying that the newly discovered statues prove Amenhotep III's funerary temple was once filled with Sekhmet statues of different sizes and shapes, similar to his temple on the east bank of Luxor, known as goddess Mut temple. This temple acted as a symbol of stability and prosperity during Amenhotep III's reign. 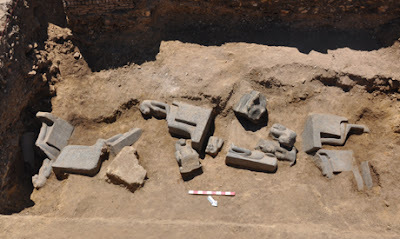 10 years ago, the archeologists unearthed a large number of statues of Amenhotep III and his wife Queen Tiye; they also unearthed some parts of the temple's walls. "The work we are doing here is not only about advancing historical knowledge, but also about saving the last remnants of a temple that was once very prestigious; it is unfortunate that it been badly damaged," Sourouzian said. The teams aim to produce a virtual reconstruction of the temple using the latest computer programmes, she added, saying that this reconstruction would show the original position of every surviving piece within the original temple.